The result is that we will seek to primarily pour ourselves into educational opportunities, mercy ministries, economic development, and loving our neighbors in all of these things. The welfare of a city begins with individuals and families. We believe that when Jesus said, “Love your neighbors as yourself,” He certainly meant those who live right around us. We encourage one another to seek the welfare of our neighbors and to treat all people with dignity, honor and respect. There are a variety of opportunities to serve our neighbors, both on an ongoing and one-time basis. FPC encourages our members to serve our community in local ministries where the Christian community has joined hands to share the love of Christ and meet needs. While this list is certainly not exhaustive, we encourage our church body to serve the larger community in some capacity. Christ Classical Academy’s mission is joining families and classically educating students to be the salt of the earth and the light of the world. Because CCA was founded as a ministry of First Presbyterian Church, a number of board members come from FPC. If you have a heart for Christian Education and the mission of CCA, this might be an area where you could serve. You might also contact PTF, Parent-Teacher Fellowship, about opportunities to serve. Life Choices envisions a community where no one regrets the Life Choices that matter most. Life Choices is a non-profit medical clinic, educating and equipping individuals to make empowered decisions, providing pregnancy confirmation, and offering programs of prevention, intervention, and restoration. If you are interested in serving at Life Choices, click here. 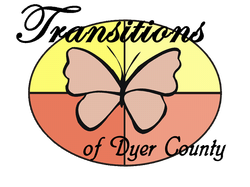 Our mission is to seek to assist and rescue the poor and needy of the Dyersburg-Dyer Co and Lauderdale County area by providing assistance and recovery services in Jesus’ name. We want to meet people where they are and help them to get where God wants them to be. Volunteers are an important part of the ministries of New Life Union Mission. Volunteering at the Mission allows you to help others while fulfilling God’s plan for your life as described in Ephesians 2:10 “For we are God’s workmanship, created in Christ Jesus to do good works, which God prepared in advance for us to do.” Click here for more. Transitions is a ministry of Jesus Christ organized for the purpose of transforming the lives of women with life controlling issues. The mission of Transitions is to nurture and disciple women who desire a new beginning through the life changing power of Jesus Christ. Women (eighteen and older) with life controlling issues (such as, alcohol and drug addictions, eating disorders, anger, depression, etc.) who desire a life change can find hope. Transitions runs almost entirely on volunteer help, who help with things like Bible studies, mentoring, building & grounds maintainance and repair, transportation, and much more. Click here for more. Mission: Providing willing and able men with the opportunity to experience a life-changing relationship with Jesus Christ and establish a spirit filled productive life, in a structured residential program. Damascus is looking for men who are willing to serve as mentors for men in the program. Other volunteers are needed as well. Click here for contact info.